Safeway and Quest Diagnostics announced a partnership last week to open a dozen Safeway-branded in-store medical testing facilities in California, Colorado, Maryland, Texas and Virginia expanding on the concept the companies teamed up with Banner Health to create in two Arizona Safeways. The facilities will feature a waiting room and private restrooms. Notification systems will be in place to allow patients the opportunity to shop while they wait. The move marks another foray into the healthcare space within the grocery retail footprint within which pharmacies are an established presence, and in-store clinics are slowly establishing a foothold. Looking at the numbers from Chain Store Guide’s Database of Supermarket, Grocery & Convenience Store Chains, 23 US supermarket chains currently feature an in-store medical clinic within at least one store, while Kroger (190) and Giant Eagle (107) are the only companies with 100+ clinics. In terms of pharmacies, the numbers are much larger. 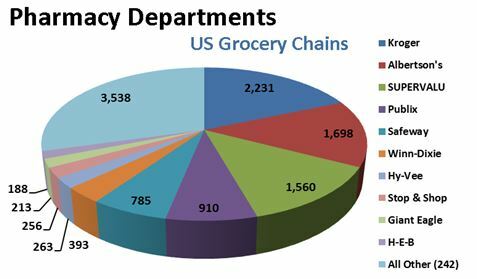 More than 250 traditional grocery chains feature at least one pharmacy department, and US grocery stores are home to more than 12,000 total pharmacy departments. The chart below captures these 12,000+ pharmacies, breaking out counts for the top ten. Source: Chain Store Guide’s Database of Supermarket, Grocery & Convenience Store Chains.